Most people experience a face rash or acne at some point in their lives. Acne occurs when natural oils and skin cells become trapped in pores, usually on the face, allowing bacteria to grow. In contrast to acne, rashes can be caused by viruses, parasites, fungi, heat or allergies, according to the Mayo Clinic. Regardless of the cause, no one wants blemishes to linger any longer than they need to. 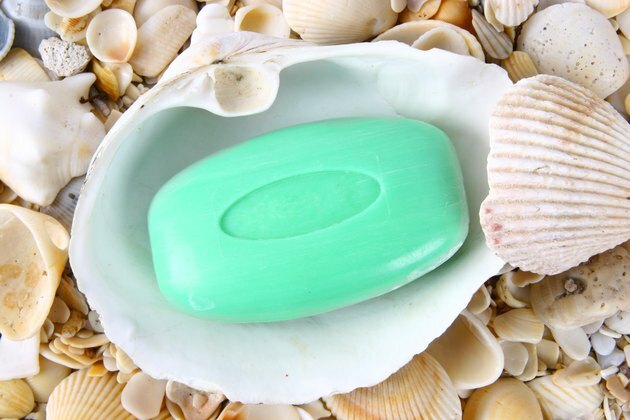 Wash the affected areas with a noncomedogenic or hypoallergenic soap twice daily. Use a clean washcloth and pat the affected areas dry with a new, clean washcloth. Never touch the affected area with your hands between cleansings. This can further irritate a rash and spread bacteria from acne. Apply a topical cream to the affected area. If you are treating acne, use a cream that contains either benzoyl peroxide or salicylic acid. If you are treating a rash, use a cream that contains hydrocortisone in a petroleum base. According to the Merck Manuals, topical creams that address itching are best. Acne, however, responds best to creams that dry out the affected area. Apply compresses twice a day. If you are treating acne, use warm compresses to draw blood to the area, helping it heal faster. Use a cold compress on a rash, as it help to lessen inflammation and itching. The Mayo Clinic also suggests bathing in oatmeal solutions, which can be found at most drugstores. Avoid reusing washcloths and towels. Identify and avoid products that cause or contribute to the problem. If you have acne, avoid the use of cosmetics that are oil based and instead choose those that are labeled noncomedogenic. The source of a rash can be difficult to identify, but common allergens include medications, cosmetics, foods and pet dander. If you can't identify the source, talk to your doctor. Your doctor will probably recommend a skin-patch test to determine the cause of the allergy. Wash hands, clothes and anything else that comes in contact with the affected area with hot water. Clean hands, towels and washcloths and clothes help to keep the affected area bacteria-free. Keep long hair away from the your face, because hair can transmit oils and bacteria. If you are experiencing other symptoms with a face rash, such as difficulty breathing, fever or pain or if the rash appears to be getting worse, see your doctor. Serious illnesses such as shingles and infectious dermatitis can cause a rash. These conditions require prescription-strength antibiotic treatment under the guidance of a health-care professional. What Are the Treatments for a Rash Caused by an Allergic Reaction?